So I decided to watch the Dr. Oz Show yesterday, and he had a whole segment about how bad sleep deprivation is and ways to curtail bad sleep habits: http://www.doctoroz.com/videos/sleep-hygiene. I break all the rules of sleep etiquette (I work in my bedroom, I check my email right before bed, I have ton of appliances blinking all night in my room, and I never go to sleep at the same time). The only thing that I seem to do correctly is that I read before bed. 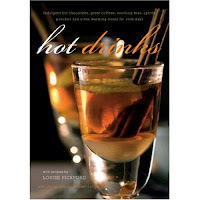 There are three books though that I have found work better than even Tylenol PM at helping me to fall asleep. They are relaxing and comforting and help me t o forget about the stresses of the day. So get in bed, turn on your reading lamp, and get cozy (just don't fall asleep with the light on). 3.) Jacques Torres' A Year in Chocolate: Last n ight instead of having anxiety dreams about my art history exam, I dreamt of luscious Pumpkin Seed Brittle and decadent chocolate bonbons. 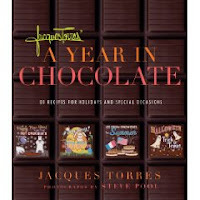 Jacques Torres will be at Chelsea Market tomorrow starting at 3:30 pm doing a book signing at Posman's.